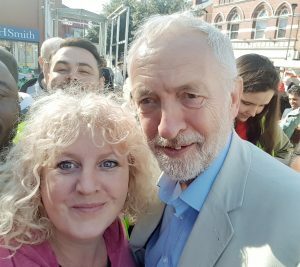 Assistant Branch Secretary for Education, Louise Harrisen-Powis, met Jeremy Corbyn in Halesowen town centre on Saturday 29 September, after he made a rousing speech to hundreds of supporters. Corbyn condemned the current government for continuing to give tax hand-outs to the rich whilst schools were being starved of funds. Making reference to the two thousand headteachers that had marched against further cuts to school budgets, Corbyn pledged to end the cuts and bring back free education, ending the huge debt burdens placed on youngsters going to university. Corbyn also pledged that a future Labour government would bring in 30 hours free nursery care per week for all 2-4 year olds.